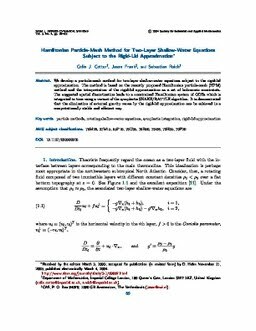 We develop a particle-mesh method for two-layer shallow-water equations subject to the rigid-lid approximation. The method is based on the recently proposed Hamiltonian particle-mesh (HPM) method and the interpretation of the rigid-lid approximation as a set of holonomic constraints. The suggested spatial discretization leads to a constrained Hamiltonian system of ODEs which is integrated in time using a variant of the symplectic SHAKE/RATTLE algorithm. It is demonstrated that the elimination of external gravity waves by the rigid-lid approximation can be achieved in a computationally stable and efficient way.